Chicago, IL. Head Coaches are held accountable for their split second, often nerve wracking decisions. The college of second guessers can debate for years afterwards if the call turns out to be the wrong one. 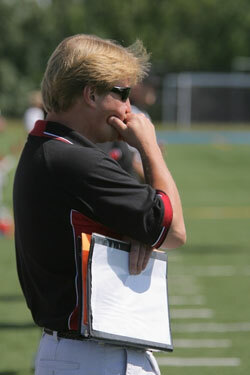 On Saturday at Holmgren Athletic Complex, after the Force scored with less than three minutes to go in regulation, Jim Stahl decided to go for the win and called for the two point conversion. It was the right decision as running back sensation Melissa Smith, lowered her head and followed her block by guard Dawn Pederson up the middle for a thrilling 8-7 victory over the Detroit Demolition. The win not only maintained an unblemished 9-0 record, but propelled Chicago to the Eastern Conference title game against the also undefeated Pittsburgh Passion July 12 at home. "I didn’t want to put my rookie kicker (Carolyn Lee) in that tough pressure situation, explained Stahl with confidence in his voice." I made up my mind quickly. I knew that we had the ability to get it done. I’m proud of this team’s winning effort." Like all of their previous matches, both teams battled like prize fighters, exchanging blows but not going down. The Force defense led by the charge of veterans Pam Schaffrath, Linda Bache, Jessica McPeake, Game Day MVP Keesha Brooks, and Darcy Leslie were outstanding throughout, pinning Detroit in their own zone the entire first quarter. On Detroit’s second offensive possession and the ball at the five-yard line, QB Bridget Porter scrambled in the end zone, being chased by McPeake and threw up a wobbly pass that Bache picked off at the 31-yard line. The Force had little success penetrating a tough Detroit front line. With nine minutes left until intermission, and the ball at midfield two straight Detroit penalties made it second and 20 for the Demolition. Porter chipped away at the lost yardage with two runs of 6 and 11 yards. When it appeared that the Force ‘D’ would hold yet again on fourth and three, a determined second effort by the Demolition allowed them to sustain their drive. Detroit ate up time on the clock, and kept the Force defense on the field, as they ran off three more first downs with running plays to set up a 25-yard field goal try by Alecia Sweeney. With just 25 seconds to go, Sweeney’s attempt fell well short, to complete a scoreless first half of play. The third quarter was met with a torrential down pour of strong winds, hail and sheets of rain that virtually destroyed the concession stand tent. The Force received the kick off and despite the adverse weather; Smith ran it back from the 30 out to the 44. After carrying the ball three straight times for a first down, Smith lost the handle and fumbled the ball away at the Detroit 33. Detroit couldn’t capitalize and the back and forth chess match continued. With less than five minutes to go in the third, the Force punted to special team’s receiver Dawn Adams. Adams fumbled, picked up her miscue and ran 75 yards down the left sideline untouched for the first score of the day. The extra point made it 7-0. The Force got the break that they worked so hard for, when at 4:23 Detroit attempted a punt from their own 35. Sweeney, also handling punting duties, had the slick ball go through her hands, as she was then pounced on at the seven-yard line by the Force defenders. Smith once again showed why she’s such a valuable runner, after a one yard gain, she powered her way in from the left side thanks to great up front blocking by Baker, Game Day MVP Rosalyn Bennett, Brooks, and Jamie Menzyk for the touchdown that brought the water logged home fans to their feet. "I just said to myself that I have to do this plain and simple," said Smith, who finished the with 63 yards on 26 carries. Force QB Sami Grisafe who literally threw her body around to make things happen, showed strong leadership at the controls. According to Grisafe the mood in the huddle for the winning two point conversion was calm but focused. "I told everyone that I will continue to give all of myself if they give me everything that they had," said Grisafe. "Everyone made eye contact, and said let’s do this. It was so special." Detroit had one more opportunity to avoid being beaten twice in the same year courtesy of the Force, when they took the ensuing kickoff to midfield. Porter, a tough impressive athlete, tried to put her team on her back and ran the ball three straight times for a first down. A Detroit holding penalty brought the ball back to the 38. Porter dropped back to pass was flushed out of the pocket by Pederson who held on and wouldn’t let go and threw Porter down for a nine yard loss. A crunching blow by Bache broke up one final desperation pass over the middle to a Detroit receiver, jarring the ball loose. Bache emphatically shook her head no with a fist clenched in the air, as her teammates and coaches jumped for joy. ‘I hit her so hard that my shoulder hurts," said Bache with a big grin on her face. ‘It was a fun way to end their chances. Without question, the better team won again today."